The color red represents love, passion, and power. Red lipstick is one of the easiest ways to breathe life into a dull and basic outfit, and every woman should own a tube. It has been a beauty staple since the days of Cleopatra, and will remain a classic long after we are gone. Wearing red lipstick can be intimidating to some people. 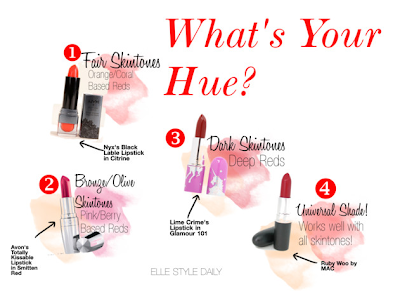 Today I'm going talk about the shades that complement each skintone and lipsticks for you to try. 3. Darker Skintones- Try going for darker reds like Ox Blood or Raisin colors. (deep purple undertones) The perfect lipstick for your complexion would be Lime Crime's Lipstick in Glamour 101. (Available at http://www.karmaloop.com/ for $16!) If you are not willing to spend $16 on a lipstick, try buying a classic red and toning it down with a dark brown liner.